Do you need definitive 3D Concrete Printing market data? 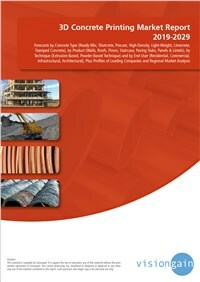 Succinct 3D Concrete Printing market analysis? Read on to discover how this definitive report can transform your research and save you time. Modern buildings and structures make fantastic use of defying convention and form and defying gravity at times. Because of the demands for low cost, environmental and efficient housing and other demands such as the reduction of waste produced in the construction industry, the advancement in the field of concrete technology has increased very rapidly. Methods like LEAN are used to identify the locations where maximum waste is produced and to find the solution needed to minimise it. The trends of these architectural demands place enormous material requirements and pose some challenges for construction and structural engineers. Because of their complexity extending current construction practices and realistic budgets, some building designs have never progressed beyond imagination. With automation and lower costs, 3D printing can bring imagination to reality. Automation through 3D printing also reduces waste production in construction, reduces the use of slab cutting tooling equipment, etc., and limits heavy manual work to prevent accidents during construction work. What does the future hold for the 3D Concrete Printing industry? Report will be released for delivery on April 22, 2019.